A ramp permit is needed to use the Department of Internal Affairs' ramp facilities. Permits are available in hardcopy from many agents around the lake, or use our online service ePermit. An instant fine of NZ$200.00 will be imposed for using a ramp without first getting a permit. Kinloch Marina is a privately owned marina and has a separate ramp permit. Purchase a 24-hour, 2 to 6 consecutive days, 2-week or 12-month permit, pay online, receive a digital image permit to your email – done! No need for printing, as long as you can produce the permit on your phone or tablet when asked prior to launching. 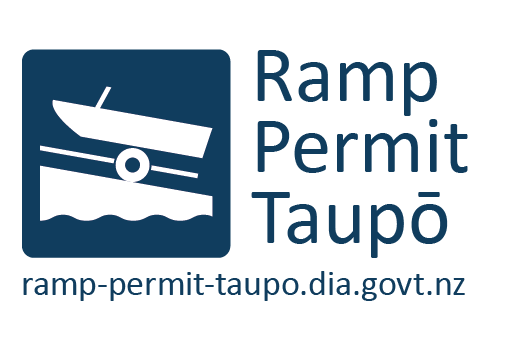 You can either scan the QR code on our boat ramp signs to be directed to our website, search online for ‘Ramp Permit Taupō’ or simply visit ramp-permit-taupo.dia.govt.nz by clicking on the icon below. A friendly reminder that there is zero tolerance if you are unable to produce a valid ramp permit when using an Internal Affairs Lake Taupō boat ramp. Hardcopy permits can still be purchased from a number of agents around Lake Taupō (see information below). Have your boat prepared prior to joining the queue. For example: bung in place, tie-downs removed, all personal gear (including lunch and warm clothing) on board, outboard support bracket and tow flag removed, etc. While reversing down the ramp, have a person walking beside the vehicle holding the painter (bow line) prepared to push-off the boat from the trailer. Then, move the boat to the jetty. If necessary, this person will walk the boat around the offside of the jetty thereby clearing the ramp area. The driver then parks the vehicle and trailer and returns to the boat, now ready to go. On return to the ramp from the day’s outing on the lake, approach the jetty or beach. If possible drop-off a person to retrieve the vehicle and trailer. Back the boat away into the lake. Wait for your trailer to be positioned on the ramp. After loading onto the trailer, drive away from the ramp to prepare for departure. Following these procedures will speed up launching and retrieving thereby ensuring a smooth traffic flow. Finally, (to avoid delays) display your ramp permit on your boat.